Well it’s Strawberry season in this here neck of the woods and oooh how we love Strawberries! I don’t know why I don’t think to post some of the simple things that I make with them. 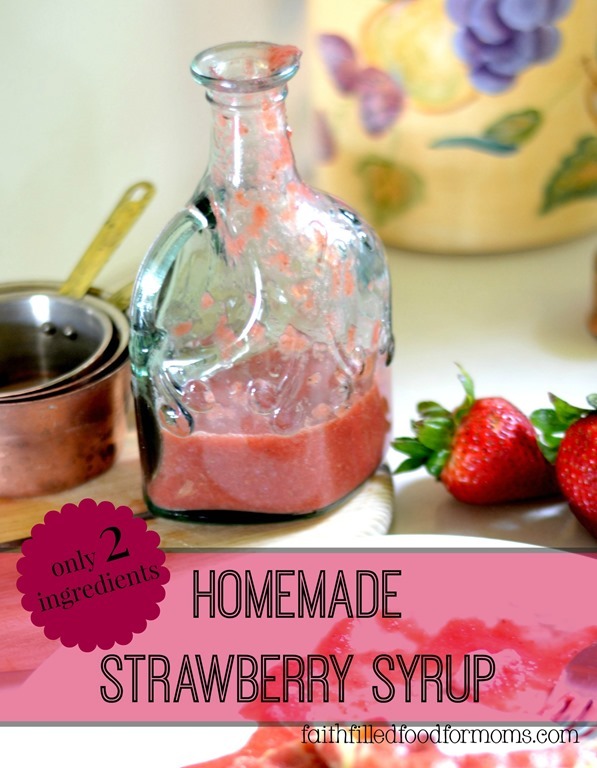 Here is a super simple Homemade Strawberry Syrup that can made with fresh OR frozen strawberries. We love to have it warm over our homemade pancakes, waffles, french toast and crepes! YUM! 1 Even better…only 2 ingredients! 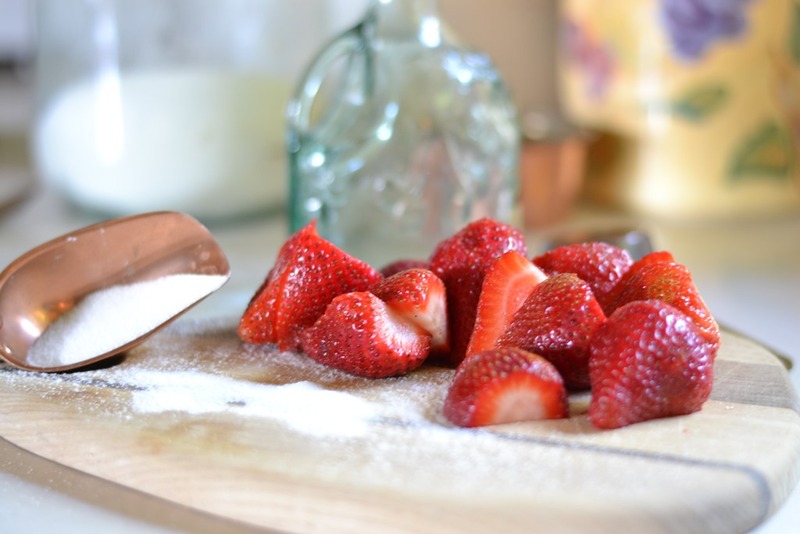 You can either blend your Strawberries in a blender, such as I did in my Ninja Blender or crush with a potato masher….or anything your want. You can also just cut up really small and the fruit will become mushy for you to smash when cooking. Then put into a pan with Sugar. Boil for about 3-5 min. and that is it. Yep..it’s deelish! 1. it’s good for you! 3. Imagine how much Strawberries you’d have to use if you did this! You can double, triple etc. this recipe and it will still be great! You can make a thinner syrup simply by adding a little more water a little at a time, until it is the consistency you want. This looks yummy! Makes me want to go find some ice cream to put it on! This sounds wonderful. Could you can this to put in your pantry? 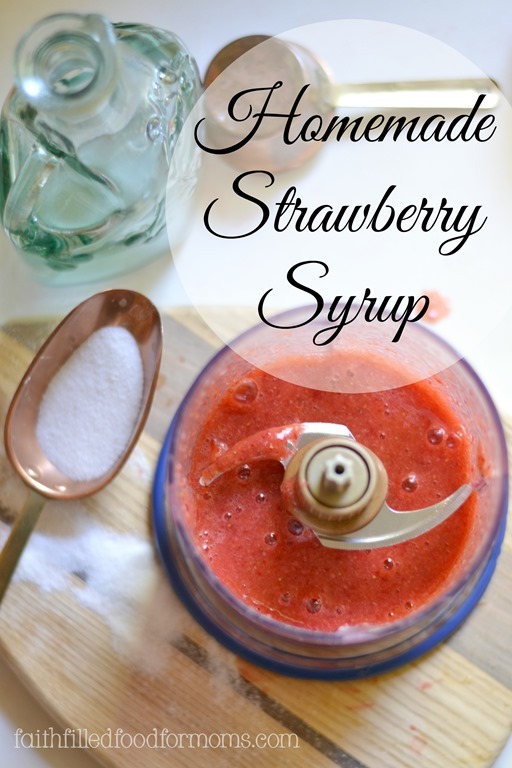 I’ve always wondered about making strawberry syrup – now I know! Thanks for sharing. Yummalicious! Thank you for sharing this easy DIY on the Art of Home-Making Mondays 🙂 I will add to my strawberry board! I just bought a pint of strawberries and although we love them, we never seem to finish them. I was planning on making strawberry shortcake but I like your idea better. Maybe still strawverry shortcake but with syrup instead. Thanks for sharing on Merry Monday. Pinning. If the strawberries are wetter than I realized before adding water, I add a bit of powdered pectic to thicken it up. It doesn’t compromise taste but might cause you need a little more sugar for sweetness. I cannot wait for strawberry season to get here!